"Greetings all. I'd like to thank you all for coming today. Deep Horizon Industries, in association with Gorth Consultancy Services, is proud to announce our latest technological delivery to the space faring populace. Available immediately is the ANC-42 Advanced Navigation Computer. While the exact nature of Witchspace is still the subject of scientific research, we are aware that it has certain directional flows. We at Deep Horizon Industries together with our project partners at Gorth Consultancy Services, decided to take advantage of these eddies and currents within witchspace utilizing feedback derived from the recently deployed GFL-1 Witchpoint Tunnel Demarkation Buoys. By extending the calcuation time before making a witchjump, our Advanced Navigation Computer enables vessels to successfully navigate witchspace in a more efficient manner that results in a lower overall energy expenditure for a witchspace jump. A pilot utilizing this equipment can save 10% of his fuel expenditures in this manner. Additionally, we at Deep Horizon Industries would like to announce the separate development of the EWI-OS-5141 Emergency Witchspace Initiator or EWI. Developed independently of the ANC project, the EWI offers a new hope for pilots. Combat is a dangerous proposition, whether entered willingly to claim a prize, begrudgingly in defense of another, or fearfully when not of your choosing. Given time, it is also inevitable for pilots to find themselves in combat. Likewise, overwhelming odds, inferior abilities compared to your opponent, or simple misfortune will one day turn the tide of battle against every pilot. Retreat is sometimes a necessity. The Emergency Witchspace Initiator makes the interminable delay between deciding to retreat and the actual act a little quicker. By allowing certain 'safety guidelines' to be optimized, the EWI-OS-5141 is able to lessen the time needed for the hyperspace motors to 'spin up'. This can be a decrease of 50% of the normal spin-time required. Vital seconds during an emergency. My legal team however would like me to add the following statement: Deep Horizon Industries would like to remind all customers that all safety guidelines published by GALCOP are there for your protection. Bypassing or eliminating such protocols may result in misjumps, faulty navigation calculations, damage to ship systems, wasted fuel, and other side-effects. Deep Horizon Industries is not responsible for any undesirable outcomes from use of this product including, but not limited to, death by Thargoid. Thank you. I will now open the floor to questions..."
The ANC offers both an equipment item for fuel savings and a general immersion behavior. The general immersion behavior operates as follows: When a jump is initiated by the player (via the ANC or by the standard 'H' key), the OXP will spawn a navigation guidance frame around a distant star. The player is then reoriented to that star to simulate true interstellar navigation. Player-controlled navigation changes (roll, pitch, yaw) are suppressed for the duration of the reorientation. READ THAT AGAIN: You will not be able to change your orientation through normal flight controls while this effect is occurring. Think of it like a docking computer. Future releases will allow this to be toggled on/off for non-ANC-Equipment jumps via OXPConfig. The EWI OXP is an entirely equipment based OXP. When activated, the EWI will initiator a jump to the targetted system but with half the normal countdown time. Use of the EWI equipment can cause certain undesired effects on the player ship (fuel waste, fuel leaks, misjumps, etc). These are meant to be risks to offset the reward of the shortened countdown. Thanks to Svengali and Submersible for your help and contributions on the ANC, wouldn't have happened without you guys! Last edited by Cmd. Cheyd on Thu Feb 07, 2013 10:18 pm, edited 1 time in total. <Downloaded> . Thanks for these excellent pieces of equipment Cmd. Cheyd (and thanks to those that helped out with this OXP ). I can't wait to check out how it works - I hope to be pleasantly surprised . Edit: Very well done indeed! Exactly what I was thinking about with the alignment - however, I noticed that the BGS sounds are still repeating themselves due to the extra countdown time. Anyway, these are two oxps are permanent additions to my AddOns folder! Last edited by CommRLock78 on Sun Feb 03, 2013 7:59 pm, edited 1 time in total. Cmd. Cheyd wrote: Deep Horizon Industries would like to remind all customers that all safety guidelines published by GALCOP are there for your protection. Bypassing or eliminating such protocols may result in misjumps, faulty navigation calculations, damage to ship systems, wasted fuel, and other side-effects. Deep Horizon Industries is not responsible for any undesirable outcomes from use of this product including, but not limited to, death by Thargoid. This sounds like fun!! Downloading!! Cmd. Cheyd wrote: The ANC offers both an equipment item for fuel savings and a general immersion behavior. When a jump is initiated by the player, the OXP will spawn a navigation guidance frame around a distant star. The player is then reoriented to that star to simulate true interstellar navigation. Gotta have that, too - the immersion effects sound great, and I need to know how you did it! Btw, very nice and entertaining announcement / story! I've added both these OXPs, but I'm a little confused as to how to use them. Both appeared for sale and I bought them. Both say they're "prime-able", but how? The standard Oolite "O" doesn't appear to do anything and there's nothing in the read-me's that gives a clue. I'm getting the alignment onto a star so I figure that's the Nav computer working, but I haven't seen any savings on fuel consumption. Dunno how to do the emergency jump, either. 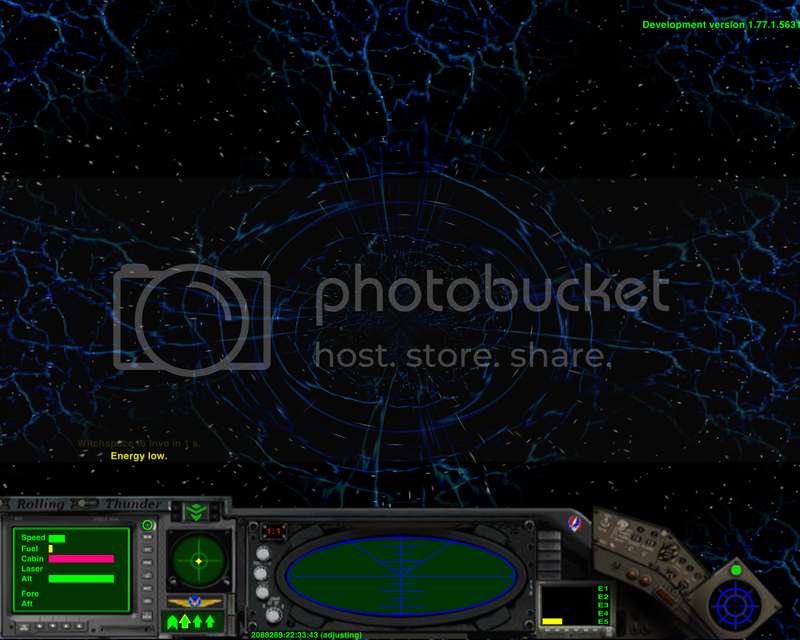 Sorry if I'm being a bit dim here, but I am fairly new to Oolite and I'm still learning the ropes. Use 'shift+n' to select the kit, then 'n' to activate it. That's got it! Thanks very much! Useful kit, is the ANC... it can turn a fatal jump into a survivable jump. Mind you... it was a close-run thing. This took me by surprise, until I re-read this.. thought I had to purchase before I noticed any difference.. very cool immersion idea. I like how if the jump is a short one, the apparent size of the star locked onto is bigger. Erm yes. It is cool immersion idea. However I am more than annoyed that the Witchdrive computer takes over the steering of my ship when I jump. This means that I am a sitting duck if attacked by the GalCops or bountyhunters when I exit a station with Fugitive status, and it also means that I have to spend more time than I want to making sure that I move away from the station and or fuel stations before jumping. Not too fond of this behavior so it would be nice to be able to turn it off, since I would like to buy the ANC. Shouldn't the immersion behavior be an OXP in itself as per the wiki guidelines for dividing OXPs into "ambience" and "equipment?" I love the ANC and the Emergency Witchdrive though! edit: changed "rules" to "guidelines" to satisfy Diziet's sarcarstic comments. Last edited by JeX on Tue Feb 05, 2013 3:30 pm, edited 2 times in total. JeX wrote: Shouldn't the immersion behavior be an OXP in itself as per the wiki rules for dividing OXPs into "ambience" and "equipment?" Those are more like classifications to make it easier to search for specific types of OXPs.. not "rules".. There's nothing that says an OXP has to be one or the other. There are several OXPs that have entries under multiple categories. JeX wrote: Erm yes. It is cool immersion idea. However I am more than annoyed that the Witchdrive computer takes over the steering of my ship when I jump. This means that I am a sitting duck if attacked by the GalCops or bountyhunters when I exit a station with Fugitive status, and it also means that I have to spend more time than I want to making sure that I move away from the station and or fuel stations before jumping. Shouldn't the immersion behavior be an OXP in itself as per the wiki rules for dividing OXPs into "ambience" and "equipment?" Although I can see your point this is what the Emergency Witchdrive Initiator is for. I will discuss a toggle setting with Cmd Cheyd for normal and Emergency Jumps. PhantorGorth wrote: Although I can see your point this is what the Emergency Witchdrive Initiator is for. Indeed. It's just very weird to install an equipment OXP and, without any warning whatsoever and even without buying the ANC, "gameplay as usual" is changed! Blammo! And it really was changed since I will always press "H" the second I get a crosshair when leaving a station, activate injectors and switch to AFT view, and then watch as my ship moves past the 5 km mark so I can make a safe jump without getting aborted. The same goes when exiting fuel stations. Yesterday I played three hours as a fugitive and my shields and cargoes got hammered like you wouldn't believe it! I would thus argue to have this be three OXPs and not two, or simply argue that the ANC creates this behaviour (and only the ANC) because of its fuel-saving capabilities, but surely only after this equipment has been bought. It would work as a nice trade-off; fuel vs. lock down and control, which could be useful for traders and haulers. JeX wrote: ...or simply argue that the ANC creates this behaviour (and only the ANC) because of its fuel-saving capabilities, but surely only after this equipment has been bought. It would work as a nice trade-off; fuel vs. lock down and control, which could be useful for traders and haulers. Diziet Sma wrote: I like how if the jump is a short one, the apparent size of the star locked onto is bigger. It looks a little odd when that star appears in front of a planet, though. Oh... the ship auto-orientation does need to be optional when making a jump without the ANC. Hadn't thought of that possibility - you've gotta be in just the right place for that to happen . I did notice that it's a placed star rather than a pre-existing star (which I think is a fine compromise, except for if, like yourself, you are in the wrong location and have that star appear in front of the planet). I'm still quite pleased with the equipment though, but that doesn't mean there's no room for refinement.